Every winter in Massachusetts and throughout New England, people head outdoors and look for fun family activities to do in the cold snowy weather. One of the more popular winter activities is riding a snowmobile. 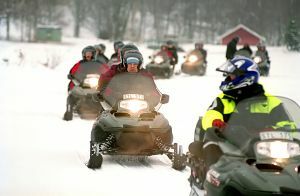 While some are lucky enough to own a snowmobile, many choose instead to rent one for the day. Snowmobiling can be a lot of fun and excitement, but it can also be very dangerous. According to a recent news article from the Union Leader, a New Hampshire man was seriously injured in a snowmobile accident, and is said to be in a life-threatening condition at a local hospital. Witnesses say the crash occurred early Tuesday morning on a local pond. The 53-year-old victim was a passenger on a snowmobile being operated by someone else around 3 a.m. Driver crashed into a rock, which was partially exposed from icy surface of the pond. The snowmobile flipped over when it hit the rock throwing female operator and victim off the machine. Victim then crashed into more exposed rocks after being thrown from snowmobile. It should be noted neither victim nor driver were wearing a helmet at the time of this serious accident. Authorities are saying driver was treated and released from hospital that day. Victim however was in serious condition from his personal injury and had to be transferred to Massachusetts General Hospital (MGH) in Boston as the level one trauma center was in a better position to offer treatment to victim than local hospital to which he was first taken. Fish and Wildlife officers are continuing to investigate cause of the serious snowmobile accident, but it is initially believed poor visibility played at least some role in the crash. A second snowmobile rider who was with victim at the time of accident called 911 immediately following the crash. Though he was not involved in the accident itself, police alleged he was a habitual offender and had an outstanding bench warrant for operating a motor vehicle without a license. Police arrested this man and took him into custody. He was then released and ordered to return to court on his own personal recognizance. While it may seem like an uncomfortable situation, it may necessary to initiate a personal injury settlement negotiation or even file a lawsuit against a friend if that friend is responsible for your injury. While every situation is different, and you should speak with your Boston personal injury lawyer about the facts of your particular case, this may be the only way you can recover for your medical bills, lost wages, pain and suffering, and other special damages. If you are in the hospital for a number of days and require multiple surgical procedures, you may have accrued tens of thousands or even hundreds of thousands of dollars in unpaid medical bills. This will of course depend on your own health insurance policy, but it is unlikely that the friend who caused the injury will voluntarily repay you for the total extent of your losses. Your friend may have homeowner’s or auto insurance to cover these damages, but the company is not likely to make a reasonable offer if you do not seek legal representation.